Did you miss celebrating Valentines Day, but you are keen to impress on your special someone? 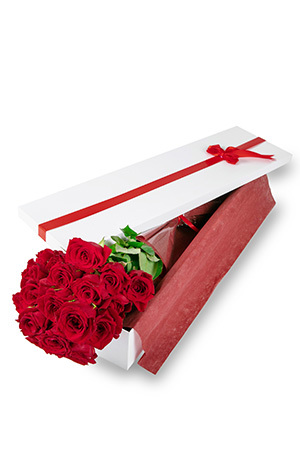 Don't wait until next year; declare your everlasting love today with this exclusive box of 18 amazing long stemmed, premium Roses. Make your recipient extra happy by adding a bottle of Red or White Wine to your order and you can be sure to be popular for a long, long time! Delivery was prompt. Decorations were good. Very satisfied. It was great, but I have a lot of reward points & the system doesn't let me use them! Easy arrange, quick service, on time delivery. Receiver was very happy with the quality of the service and flowers. Prompt delivery..although I ordered the boxed roses but it seems to be a bouquet when delivered. Not sure what happened, but not important to me..